Are you planning and saving for future expenses or events? Do you feel like you have lost control over your savings account balance? If you are saving money, do you know what that money is designated for? You forget to save for the car insurance that is due twice a year, it can throw your budget all out of whack. You have to pull money from this account and delay paying that other bill by a week in order to pay that expense that you knew was coming for the last six months. Lack of planning. Christmas - happens the same time every year! But, you did not save for it and now you have to figure out how to pay for Christmas again this year. Do you really want to put all those gifts and food and travel on a credit card again this year? Do you really want to go deeper into debt? Back to school - do you panic when you have to buy all of those new clothes and shoes and school supplies? Is that going on the credit card too? Do you go into a tailspin because of the expenses that you know are coming, but you did not save for? You know they are coming, but you did not have a plan in place and the only alternative is to rack up more debt? -- You have a plan and you are saving money every month for designated expenses. -- Your budget stays the same every month. -- You can trust your numbers. -- And you know that you can cover whatever comes up in the future. You will get the workbook which will guide you through the process of determining the sinking funds/targeted savings accounts that you need. You will learn which items you need to save for RIGHT NOW. You will gain a better understanding of your money and your behavior towards saving money. 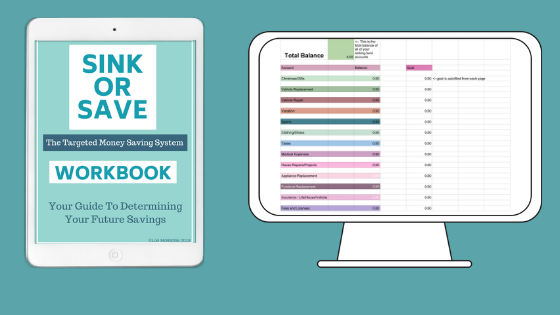 You will also get the spreadsheet where you will keep all of your sinking funds/targeted savings accounts organized in one spot. Your savings goals and your total amount saved will be all in one place. You will learn to become better disciplined with not only your money, but your decisions surrounding money. You will have a plan. All the time. Every day. Every pay period. Every month. Every year. You will have a plan for your savings. 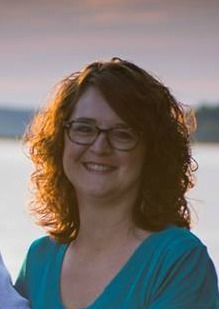 Lori's spreadsheet took all the headache out of coming up with the needed know-how for creating a spreadsheet, and added such great sinking funds ideas and categories! Simply enter your numbers for stress free budgeting. This spreadsheet is amazing. It will help you remember things you should be saving for but probably aren't AND keep track of everything in one place. As a new mom, I knew I needed to take control of our finances. I went into this not understanding what sinking funds were and now I feel I have a handle on what they are and how to save for them thanks to Lori’s system. She thought of everything on the spreadsheet and I feel confident we can create a realistic plan for these future expenses of ours instead of panicking when they come up and wonder where the money will come from. Yes, I know you could do this on your own. I hear that ALL. THE. TIME. But will you really? Seriously. 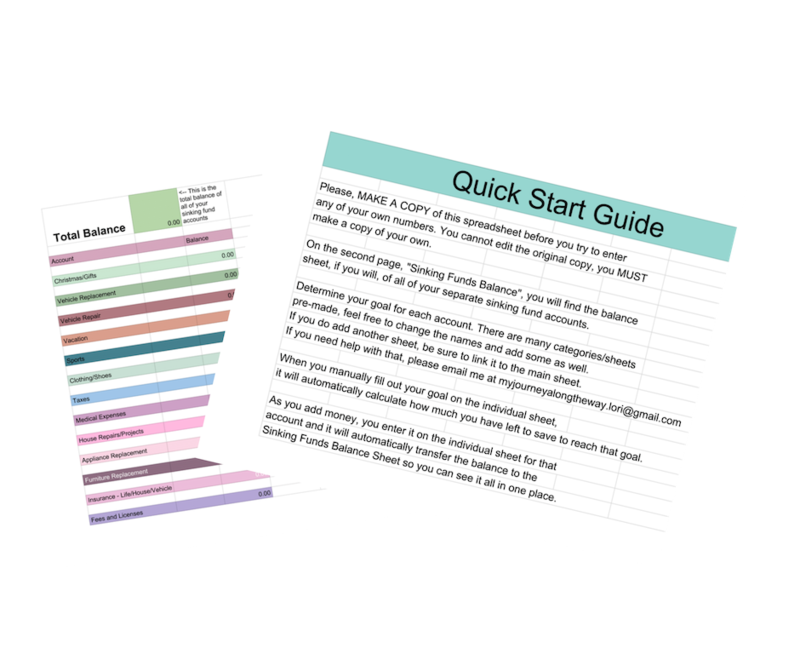 The workbook and spreadsheet are already done, waiting for you to dive right in. No more excuses, you can create that plan TODAY! Hi there! I am a mom, wife and a savings pro. I blog at My Journey Along the Way, where I help others save money, budget better, and create their dream life for themselves and their family. Saving money is my passion. Disclaimer: This spreadsheet is not intended as professional financial advice. If you need professional advice, please seek out a CPA in your area. Refunds: Because this is an instant download, refunds are not available. Get ready to rock your savings! 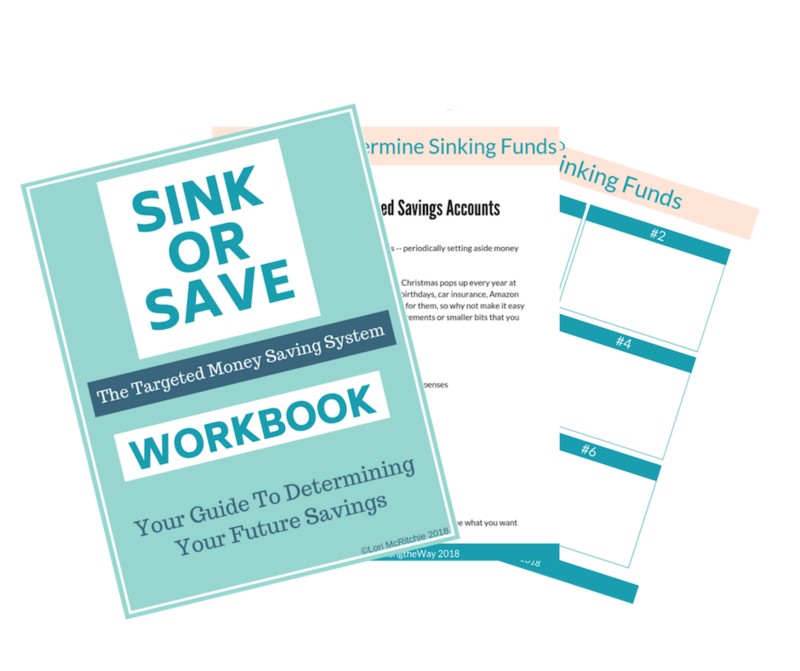 Sink or Save might just transform your financial life! Please follow the download directions and if you have any questions at all, please let me know.